Rapid data growth drives up the cost and complexity of managing IT infrastructure and exposes organizations to additional risks. Capacity optimization techniques such as data deduplication have proven effective in reducing storage costs and simplifying data protection. However, questions have risen regarding how such techniques impact regulatory requirements for the long term retention and preservation of data and ensuring the authenticity and integrity of protected information. 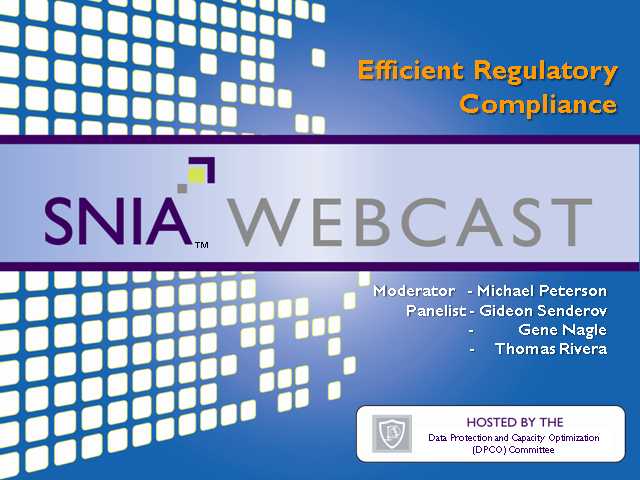 Experts from SNIA's Data Protection and Capacity Optimization (DPCO) Committee are pleased to present this webcast to discuss how capacity optimizing systems can support and improve regulatory compliance. The format of this webcast will be a short tutorial presentation followed by a panel and audience discussion.